When you choose Orchard-Rite, you choose a partner in success. We stand behind you with 40 years of expertise and a commitment to helping you succeed. Orchard-Rite® wind machines bring Pure Peace of Mind. We stand behind you with wind machines that are built to stand the test of time. We're proud to say that many of the original Orchard-Rite® wind machines are still in operation more than three decades after they were installed. What sets us apart? We manufacture all the major components of each machine including gearboxes, control panels, towers and blades. We use the finest raw materials and skilled craftsmen precision machine, fabricate and assemble our machines under a strict quality control program. Orchard-Rite® blades are the safest, most efficient blades on the market. Our all-fiberglass blades are constructed using a unique design and proprietary process. We are the only manufacturer that does not limit its blade warranty with a wind exclusion. Orchard-Rite manufactures a variety of models, including stationary, portable and lay-down, and offers options to customize your equipment to provide the best possible protection. Your local dealer will work with you to determine the horsepower, model and options that best meet your needs and the location that will maximize your machine's performance. Wind machines are not just a grower's best friend they are also the most environmentally friendly means of frost protection. Whether they are powered by diesel, propane or natural gas, all engines are certified to meet current EPA emissions standards. Dependable, efficient, safe and eco friendly, Orchard-Rite® wind machines are Pure Peace of Mind. Pacific Distributing Inc. will be at booth 631 at WiVi Central Coast on March 13, 2019. Come stop to talk to one of our specialists about our Wind Machines. Over 40 years and with 25,000 wind machines sold worldwide, Orchard-Rite® Wind Machines have continued to lead the industry in wind machine frost protection. Using the highest quality materials, the latest machining technology and a dedicated team, you receive a partnership of Pure, Powerful, Performance. Orchard-Rite provides the grower with multiple options of Towers, Engine Packages and over fifteen Optional Equipment Accessories. Even with all these options we’ll make it simple, we’ll work with you step-by-step to customize your Orchard-Rite® Wind Machine to your needs so you can rest easy knowing your crops have the best protection. Watch how Andy Timmons of Lost Draw Vineyards in Lubbock, Texas is able to protect his vineyards against frost with the Orhard-Rite Wind Machine. Orchard-Rite® wind machines bring Pure Peace of Mind. We stand behind you with wind machines that are built to stand the test of time. We’re proud to say that many of the original Orchard-Rite® wind machines are still in operation more than three decades after they were installed. What sets us apart? Orchard-Rite offers a variety of models, including stationary, portable and lay-down, and provides options to customize your equipment to provide the best possible protection. Your local dealer will work with you to determine the horsepower, model and options that best meet your needs and the location that will maximize your machine’s performance. Wind machines are not just a grower’s best friend – they are also the most environmentally friendly means of frost protection. Whether they are powered by diesel, propane or natural gas, all engines are certified to meet current EPA emissions standards. Maximize your crop yields by working with Mother Nature instead of against her. 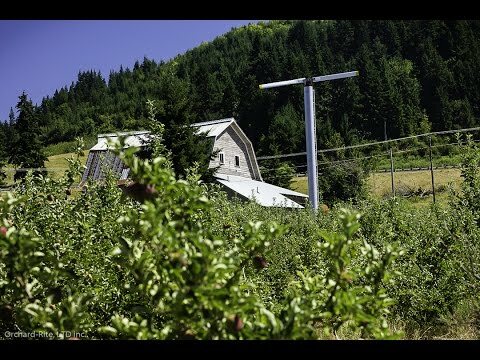 Wind machines are Pure Science, working with nature to pull the warmer air down into the orchard or growing field to raise temperatures and save crops. During the day, the sun heats the earth’s surface. The soil and trees become warmer than the air in contact with them and in turn heat the air. At night, the colder air settles to the ground and the warmer air rises forming an inversion. Radiant frost occurs when a sudden drop in temperature due to irradiation of the trees and soil causes the surrounding air to cool rapidly. The chilled air settles into the lowest areas in the orchard or growing field causing frost damage. Wind machines pull the warm air from the inversion layer down into the crop zone, raising temperatures as much as six degrees, thus saving crops from being injured. Grapegrowers have relied almost exclusively on water to protect tender young vine tissue from being damaged by spring frost. But due to drastic drought measures, growers are moving from sprinklers to wind machines as an important feature of their frost protection plan. With more than 80 percent of growers employing these practices, they can dramatically reduce water use on a vineyard from 30-40 percent. As the focasted El Nino Weather systems makes bigger news, vineyards can anticipate a very wet fall and winter. Great for the soil, but potentially damaging to late harvest grapes facing mildew. Wind machines can assist in drying out the vines as well as ensure fog or early morning drizzle doesn't become a problem leading into fall. Don’t let frost take you by surprise! Don’t let frost take you by surprise and rob you of a profitable harvest. Orchard-Rite pioneered auto-start technology in the late 1990s, giving growers around the world the assurance that their crops would be protected automatically. In fact, many growers have had their machines come on when they didn’t think there was a frost. Pre-setting start and stop temperatures not only gives you peace of mind, it also reduces fuel and labor costs. Orchard-Rite’s Auto-Start™ is the most dependable system on the market today. The Auto-Start is available as an option on all new Orchard-Rite® wind machine models. The system can also be retrofitted to most makes and models of wind machines. A probe located inside of the protection area continuously measures the ambient temperature in the orchard or growing field. When the temperature drops to a pre-set level, a safety alarm sounds before the system starts the wind machine. When the temperature rises to the pre-set shutdown temperature, the system automatically shuts down the wind machine. Orchard-Rite’s Auto-Start™ system will give you Pure Protection. Why have wind machines proven to be so successful in protecting crops? Wind machines are an effective tool for protecting a wide variety of crops from the damaging effects of frost in locations around the world. Other systems such as overhead sprinklers, heaters, helicopters, and air drains provide some degree of protection. However, wind machines have a number of advantages, which are not available from these systems. Wind machines protect crops by raising temperatures. They pull down the warmer air on radiation cooling nights and ventilate the growing area to prevent pooling of cold air. Most importantly, only wind machines provide air movement across the plant surfaces that prevents them from supercooling. On any still, clear night, fans prevent the buds from supercooling up to 4° F (2.2° C) colder than ambient temperature. Even on weak inversion nights, wind machines substantially reduce the chance of supercooling. Wind machines are a natural form of frost protection that do not affect the growing environment or the crops. Wind machines duplicate nature's protection the wind. Most growers have experienced nights with temperatures at or below critical levels and if the wind continues to blow, they see minimal damage. The damage occurs when the wind quits not only because the temperature drops dramatically, but also because the bud will turn 4° (2.2° C) colder than the air temperature. Do wind machines create a wind chill effect on crops? No. Wind machines have the opposite effect by keeping plant surfaces warmer under still, calm conditions. On cold, clear, calm nights, the plant surfaces radiate their heat and actually become colder than ambient air temperature. Wind machines warm those surfaces by moving air across them every five minutes. At what temperature should the wind machine be started? Because of the supercooling that takes place when the wind dies, we recommend starting the wind machines 4° F (2.2° C) above the critical temperature for the crop being protected. What do you mean by the critical temperature? Critical temperature (view critical temperature charts) is the temperature expected to inflict at least 10% mortality in the buds, fruits, canes, or woods, depending on the crop. In tree fruit crops such as apples, pears, peaches or apricots, specific tables have been created after testing that identify the expected 10% kill temperatures. In some areas, the industry provides freezer testing of the wood to determine the temperature limits of the various crops during dormancy periods where the bud charts do not apply. When should supplemental heat be used with a wind machine? Supplemental heat is used on nights when the forecasted low is more than 4° F (2.2° C) below the critical temperature. The wind machine can struggle to maintain protection on those nights, especially if there is a cold drift bringing cold, untreated air into the block. The use of supplemental heat can be expected on nights when the sky clears early, the wind dies early and there is a dew point that is 5°+ (2.75°+ C) below the critical temperature. 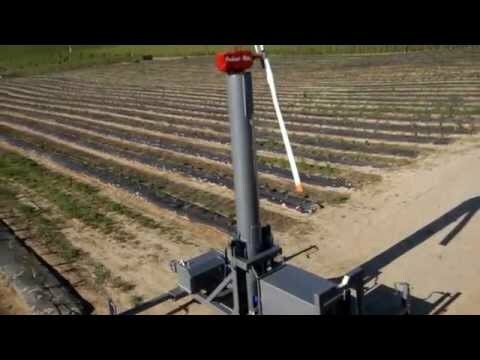 The wind machine will circulate the heat through the block and between machines to prevent the heat from dissipating into the air above the crop. Where is the use of supplemental heat most important? Supplemental heat is most needed on the side of the block where cold air is infiltrating the protection zone. Heat in this area will be carried into the block by the drift and will help the wind machine keep the temperature above critical on the edge. Without the supplemental heat, the temperature on the drift edge will decrease during the night and damage will occur as the machine struggles to keep the temperature above critical. Cold spots develop where cold air pools behind ditch banks, road beds and in low areas. Supplemental heat can be placed in lines between the wind machines so the heat can be circulated back and forth to help improve conditions in the entire block. What types of fuel are used for supplemental heat? Many forms of supplemental heat are used, but the most common are under-tree sprinklers, diesel or propane heaters and wood- or coal-fired heaters. Under-tree sprinklers Growers utilize under-tree sprinklers to run large blocks (5+ acres) of water at 40 plus or minus gallons/minute/acre. The heat and humidity generated give an additional 2° (1.1° C) of temperature lift (2 hectares and 375 liters/minute/hectare). Heaters Metal pots heated by diesel, propane, wood, coal, hay, etc. can help the wind machines with an additional 2-4° (1.1-2.2° C) of lift depending on the strength of the system. Once started, should the wind machine ever be turned off during the night? Yes If the temperature rises 4° F (2.2° C) above critical due to the arrival of clouds or the wind increases to a steady 10+ MPH (16+ KPH). At that point, the wind is providing the same protection that the wind machine provides. No If the conditions are clear and there is variable wind, you should continue to run the wind machines even if you are seeing temperatures well below the critical temperature. Because the machines are preventing supercooling, you are still benefiting the crop with the wind machine running. During the day, the sun heats the earth's surface. The soil and trees become warmer than the air in contact with them and in turn heat the air. At night, the colder air settles to the ground and the warmer air rises forming an inversion. There are two types of weather conditions under which freezing temperatures occur, advective and radiational. In an advective freeze, most commonly occurring in extreme latitudes, cold air masses from the Arctic migrate south. These air masses are below freezing at the surface and become colder with elevation. Because this type of freeze occurs mostly in the winter in extreme latitudes, it is expected that crops are not planted or actively grown during the normal season for advective freezes. However, the arrival of an early fall or late spring advective freeze can be devastating to crops. The second and most common type of weather condition that causes freezing temperatures is a radiational freeze. This type of freeze happens when a relatively cool, but dry air mass moves into an area. Even when afternoon temperatures are warm, after sunset radiational cooling at the earth's surface causes temperatures in the lowest layers of the atmosphere to fall below freezing. While temperatures at the surface fall 30 degrees or more below the afternoon high, temperatures just a few hundred feet above the ground remain constant, forming an inversion. Inversions are designated as either strong or weak, depending upon how much higher the night temperature is at the 50 to 60 foot elevation than at the 3 to 5 foot elevation. Wind machines are most effective when the inversion layer is 15 to 75 feet above the crop zone and when the temperature differential is from 3 to 7 degrees. The popularity of wind machines has grown steadily since the early 1970s when rising fuel costs made oil-fired heaters an expensive option for frost damage control. Today, in extreme cold, heaters are used in combination with wind machines. Wind machines have proven to be an effective and cost-efficient means of protecting crops of all kinds against the damaging effects of spring frosts and winter freezes.